CHAIRMAN: Thank you. I do not propose to defer this matter any further. Having regard to all aspects that have arisen in relation to it over a considerable number of weeks, it is clear that time is by no means an unimportant consideration and I propose to proceed to rule on it. I have considered all medical reports afresh and all representations made on behalf of Mr. Charles Haughey. In addition, as has already been mentioned, I have met, along with the Tribunal legal team, with Mr. Peter McLean, the consultant urologist retained by Mr. Haughey at his request this morning. Prior to that meeting a short additional statement or report was furnished by Mr. McLean and this also has been taken into consideration. The content of what was stated at the meeting with Mr. McLean, like all private Tribunal meetings, remains confidential unless otherwise ordered for sufficient cause. I have also taken the advice of my legal team and I have had regard to my own observation of Mr. Haughey as a witness over the several days that he testified earlier this year. Having balanced all the interests involved, I remain of the view that subject to what I shall state, the Tribunal should proceed to examine Mr. Haughey on the basis I have already indicated in recent days. The Tribunal believes that the disabilities from which Mr. Haughey suffers can most effectively be mitigated by invoking the provisions of Section 1(1)(c) of the 1921 Tribunals of Inquiry Act and by the making of an order for the examination of Mr. Haughey on oath. This examination will be conducted in private with a view to alleviating stress and avoiding any significant risk of exacerbation of Mr. Haughey’s general health so as to enable his examination to be conducted in circumstances which will afford him the best opportunity of recalling and ordering facts. This view accords with the advice that has been furnished to the Tribunal by Mr. Williams and Professor Rossor, the two consultants from England retained by the Tribunal, and I have also given full consideration to all matters urged and set forth in the several medical reports submitted on behalf of Mr. Haughey. At present as regards the actual details of the order, I am minded that the examination occupy no more than four hours a week in one-hour sessions to be held on different days. This examination will be conducted at Dublin Castle and the Tribunal envisages that arrangements will be made to facilitate the examination in a private room. There will, nevertheless, be ample space for Mr. Haughey’s advisers and for the attendance of a stenographer. There will, of course, be a daily transcript of the examination but that transcript will not be made available to the public unless and until I, as Chairman, direct that it be adduced in evidence at the Tribunal’s public sittings. Of course I should think it likely I would adopt it in due course. The same goes for any exhibits which may be referred to in the course of the taking of his evidence. This step is being taken so as to avoid the stress associated with exposure to repeated daily media comment and the impact this might have on Mr. Haughey’s ability to give evidence. 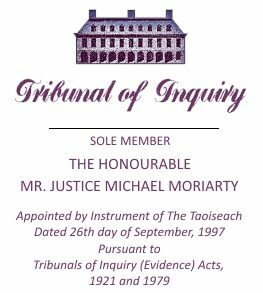 In so ruling, I am mindful that, in addition to the fact-finding task imposed on it by the Oireachtas, fair procedures require that as far as possible from the standpoint of the Tribunal, Mr. Haughey should be enabled to give to the Tribunal the best possible account of himself in relation to all or any matters which could give rise to findings critical of him. It should not be thought that I am, in what is neither a pleasant nor easy exercise of jurisdiction, neglecting the medical or humanitarian factors urged. It is to this end that the further abridged daily duration and private basis of examination has been provided for. In order to further abridge what would otherwise have been the duration of taking the full balance of Mr. Haughey’s testimony in ordinary public sittings, I am prepared to make use of written questionnaires seeking responses from Mr. Haughey which in due course could be affirmed in examination, an aspect already communicated to Mr. Haughey’s solicitors in correspondence. Indeed, had this or a similar regime been adopted since the approximate cessation of Mr. Haughey’s public testimony, his evidence, in its entirety, would, in all probability, have by now been concluded. I also propose to afford priority in such examination to those issues that are of greatest pertinence to the Tribunal’s Terms of Reference and which most clearly potentially import a possibility of findings adverse to Mr. Haughey. Further, on commencement of the procedures now provided for, I propose to assess and monitor with care on a daily basis what transpires and if it appears to me that what is entailed is, in all the circumstances, unfair or oppressive or likely to give rise to undue adverse risk, I retain discretion to amend my view. As regards the actual form of the order that I am proposing to make, it will recite the identity of the Tribunal and will state it is ordered pursuant to Section 1. (1)(c) of the Tribunals of Inquiry (Evidence) Act 1921, that Mr. Charles J. Haughey of Abbeville, Kinsealy, County Dublin, a witness to the Tribunal, be examined viva voce on oath before the Sole Member of the Tribunal at Dublin Castle in private on a date or dates to be determined and that a report of the evidence be kept and that such report be tendered to the Tribunal for consideration, and if so directed, be admitted in evidence at public sittings of the Tribunal on such terms, if any, as the Tribunal may direct. That concludes my ruling in relation to this aspect and does it remain the position, Mr. Coughlan, that it is now contemplated that the further business will turn to what was yesterday intimated as being a private session on foot of the specific exemption provided for in the Act?